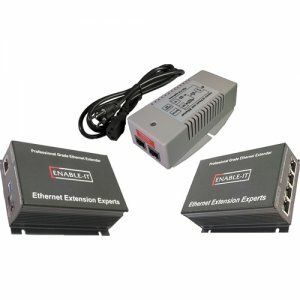 The Enable-IT™ 865 Pro Single-Line Ethernet Extender Kit is the world's only available solution to deliver Voice, Data and PoE in a combined package that exceeds the IEEE distance limitations for all Ethernet equipment and 802.3at PoE Plus. The 865 enables the simple installation of a PoE device up to 2,500ft (762m) From your LAN and Power Source. This is ideal for installing PoE IP Security cameras or PoE WiFi Access Points or for a standalone remote self powered LAN up to 3,500ft (1,067m).